So, in the season seven opener, this thing happened. And this thing, as far as I can tell, has two possible implications, and I don’t really like either of them. The thing was this: when the doctor and crew got sent to the Dalek asylum, they were given wristbands to protect them from the nanogenes that turn all living things into what I am going to call stealth-Daleks. Their physical appearance changes, and they may not even realize they are a Dalek until they are activated at an opportune moment to kill things. Amy’s wristband gets stolen and she starts showing signs of being turned into a Dalek (we’re told that in order to make a Dalek, you “subtract love and add anger,” and Amy starts acting angrier than usual). There’s a slightly forced but kinda touching scene here where Rory tries to give Amy his wristband because he figures it’ll take longer for him to be converted, as he loves Amy more than she loves him, but she convinces him otherwise just as they anti-climactically discover that the Doctor actually sneakily gave Amy his wristband before he left to go save Oswin (who was awesome; I’m so sad she won’t be a recurring character). 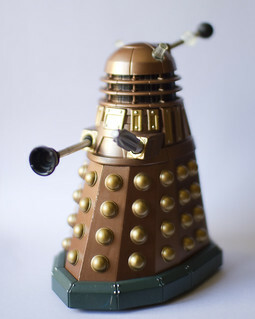 Anyway, the point is that the man is full of hate/anger toward the Daleks, and at risk of turning into one. But we don’t hear boo about it. And life has gone on, dinosaurs on a spaceship happened, more episodes to come. 1) extraordinarily sloppy writing. Either they had intended to include some stuff about the Doctor changing and cut it for length reasons, but kept the Amy/Rory conflict because it was important to establish that they are staying together, or they just forgot about the implications for the Doctor completely. Whatever problems I may have with them, I have way too much faith in the writing staff to believe this is the case. 2) The Doctor is now a stealth-Dalek. I’ll be watching for evidence of this as we go forward. He did kill a man who was begging for his life in “Dinosaurs.” This isn’t unheard of for the Doctor, true, but it isn’t the person he likes to think of himself as usually, especially not since Donna called him out on it repeatedly, and he came around to her perspective. Perhaps there will be more to come. Quick, someone explain to me why I’m wrong!